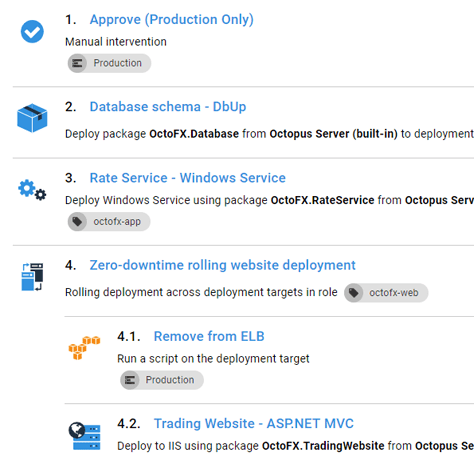 Octopus Deploy makes it easy to automate the deployment of real-world ASP.NET applications. Build vs. deployment. What's the difference? Automated build servers like Jenkins, TeamCity and Team Build are designed to enable the practice of continuous integration. They do this by providing a single place to verify that the code a developer has committed compiles, that unit tests pass, and that it's safe for other developers to merge their changes. Practically speaking, they also settle the age-old "it builds on my machine" debate. A build server runs an entire build sequentially on a single agent. There are usually many servers involved in a deployment, and some deployment steps need to happen in parallel. Builds embrace the "fail fast" principle. If a problem is encountered during a deployment, we often want to manually intervene, or skip the broken step and proceed with the rest of the deployment. Build server permission & auditing models aren't usually designed for release management. The best engineering teams recognize that build and deployment are fundamentally different. There are some similarities - they both involve automation - but the architecture of a robust deployment system is simply different to that of a build server. Read more about why build servers are different to deployment servers. Most cloud platforms and build servers claim some kind of deployment capability. Octopus is unique because we focus on being world class at deployments, and integrating well with all of the major build servers and clouds. Octopus does one thing and does it very well: deployments. 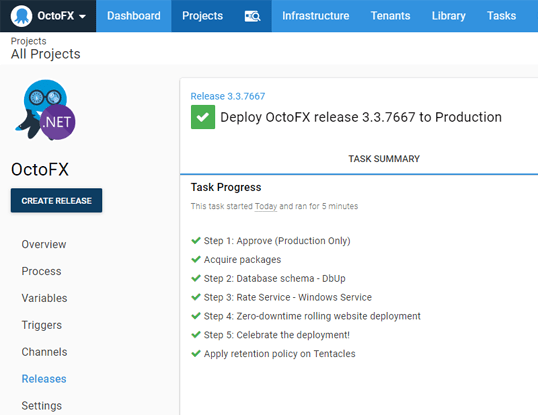 As a dedicated deployment automation server, Octopus Deploy has features not seen in any other deployment automation tool. Features like first-class multi-tenancy support, managing your SSL certificates, powerful built-in deployment steps that save you a ton of time, rich permissions and auditing, delta compression to reduce downtime during deployments, and a whole lot more. You already have a source control system and a build server. Octopus doesn't replace these, we turbocharge them. Let the build server focus on what it does best: compiling code and running tests. Octopus takes care of deploying and promoting releases between environments. This is your recipe for how your application will be deployed. 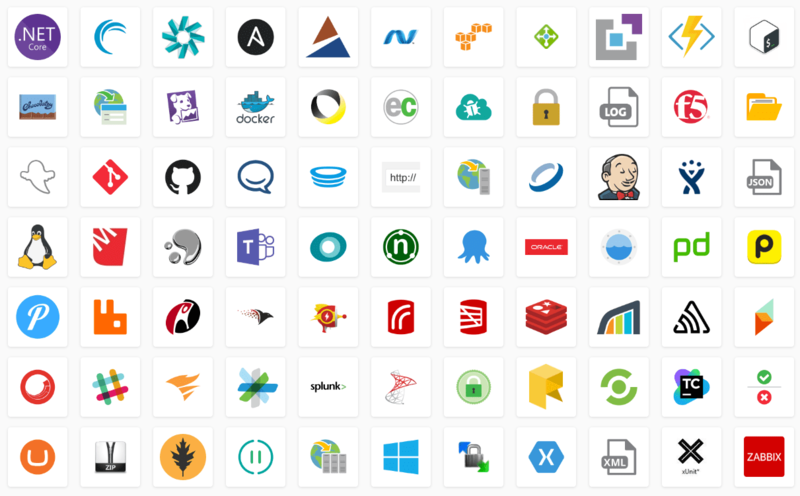 Octopus comes with over 300+ built-in and community-contributed step templates for deploying just about anything. You can also add script steps that use PowerShell or Bash, or manual intervention steps to include a human in the process. Every environment is different. 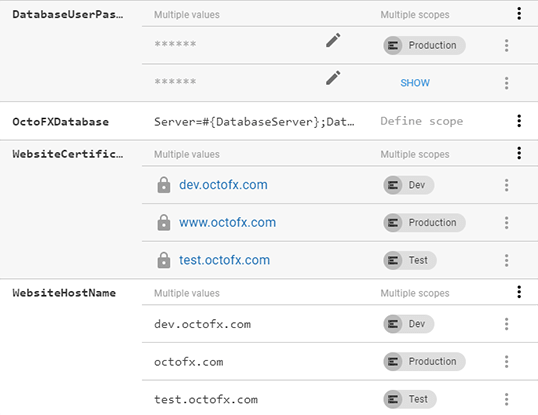 Octopus takes care of your test and production configuration settings, stores your secrets securely, and automatically replaces values in your configuration files - no scripting needed. Self-service deployments mean anyone on your team can deploy a release when they need to, or use permissions to control who can deploy to production. Octopus brings the deployment logs into a single central view, even as deployment steps run in parallel, so you'll always know what's happening. Tired of being asked what version of the app is in production today, or not sure if last night's test deployment was successful? Octopus radiates information, telling your team at a glance what's deployed where. Production deployments are still the riskiest part of software development. If something goes wrong during deployment, the stakes are high: extended downtime, angry customers, and the potential to need to roll back. Solutions like Azure DevOps have a different deployment process for each environment, meaning that the process that deploys the app to your test environment is not the same as the one that promotes it to production. When you deploy to dev, do this. When you deploy to test, do that. Keeping them in sync requires a lot of copy and pasting. Octopus has a very unique model, that is all about consistency. And it's this consistency that makes deployments reliable. Octopus uses the same deployment process for each environment, using only variables and some conditions to skip steps that might not be appropriate. Since the production deployment process is the same as the pre-production deployments, you're essentially testing the production deployment process every time you deploy to a test or dev environment. By the time you deploy to production, we've run that same process a dozen times in your pre-production environment, so you'll be confident it will work. This core focus on consistency is everywhere in Octopus. We take a snapshot of your deployment process when you create a release, so that if you change the deployment process later, you won't accidentally run the new, unproven process when you promote the release you've been testing all week into production. Multi-tenant deployments in Octopus enable consistency even if you deploy the same application to thousands of end customers. And step templates allow you to create reusable deployment steps that your whole team can share to ensure every application is deployed the same way. Deploy just about anything without scripting, from Azure Functions to Windows Services. Send Slack notifications, notify monitoring tools of a deployment, upload files to your CDN, run a SQL script - Octopus probably has a deployment step for it. Octopus is used by over 20,000 companies, so many of these templates are contributed by our community. View the full list of templates in the community library. Octopus Deploy is the only deployment server that makes it easy to deploy applications on behalf of many end customers. Securely store and deploy X.509 certificates for your web sites, and be notified when they are due to expire. The Octopus web UI is built over a REST API. Anything the UI does, you can do too. Make your next deployment an automated one.